Diffusion Sapphire Factory – manufacturer of the the only treated sapphire that is close to natural. The word diffusion scares people away, especially those that were born in the earlier 60’s. But for the new millennial, the treated sapphires are absolutely normal. The earth’s crust is depleting its sources of natural raw sapphires, especially those that come clean and for the long run we believe treated sapphires will definitely create its market, just like Lightbox from Debeers has set the jewelry industry on fire by launching Created Diamonds. Navneet Gems and Minerals is a wholesale diffusion sapphire factory located in the heart of Bangkok, at Silom Road. Our 24 years of absolutely hard work and patience has led us to diversify into as many as 140 types of stones. Sapphire and Rubies are a very important for our gemstone cutting factory in Bangkok. So what is the difference between a diffusion sapphire and other treatments? 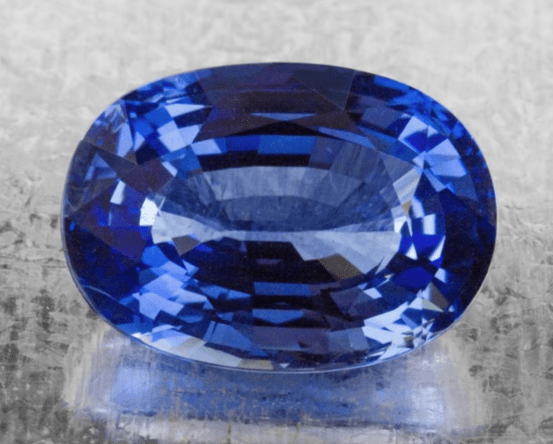 Most people already know the difference between heated and unheated sapphire but its very important to know the different types of treated sapphire in the gem industry. Diffusion is considered the best treatment in sapphires because the stone is actually a natural stone, with its inclusions and internal flaws being unchanged, only a blue color is “diffused” into the natural looking clear sapphire. As mother earth gets tired, there is still a lot of sapphires to be mined but most of them come out as poor color, (light) and not much color. These are the stones that are used to treat with Latice diffusion. When diffusion sapphire from Thailand is compared with other treatments like the glass filling, its much more sustainable and maintains its market because glass filling has color, clarity and everything else enhanced. The inclusions are turned into the base color and it disappears. Critics have mentioned glass filling treatment as not sustainable (the glass starts to come out) and not real ruby or sapphire because of too much filling. A primitive approach (Diffusion sapphire process): The easiest method of differentiating diffusion sapphire is by taking a torch, lighting it on, putting a tissue on top of the light (so the torch is facing your chin) and if one layer of tissue is leaking too much light, put some more layers until only 35-40% of the light is coming out. Now put the stone on the tissue with light from the underneath, you will see layers of diffusion especially concentrations of color on the edges. This is a clear sign that this sapphire has been treated with lattice diffusion. However, please note this is a very easy quick check, but its not a concrete answer, the 100% way is to have it tested at a lab. It’s very important in this tough competitive business, to find a source that’s reliable, consistent and most important priced right. The jewelry business is much more tough then it was 10 years ago, you have to not only beat competition but also make sure you are 3 steps ahead. One of those steps is your source of colored gemstones. Navneet Gems’ customers worldwide accept that since they have been in touch with our company, its not only become better for them, but they have excess to much more information then they were earlier. Asian manufacturers of gemstones tend to keep a lot of secrets for themselves; the treatment, factory, capacity, sales volume – you’ll never get these equations sorted with them. With us, we give you as much information as we can to educate you to be a good buyer. 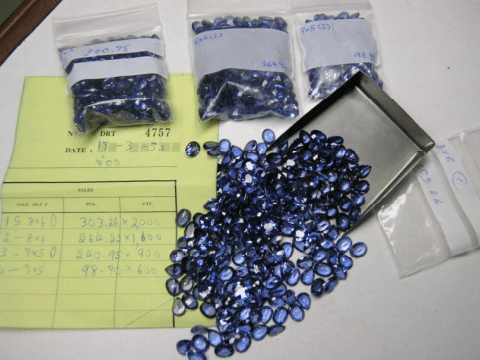 Our treated sapphires are treated with our thai partners, the diffusion of the sapphire take place in Bangkok, near Silom Road and in Chantaburi in laboratories. Our cutting factory is located near the center, just few kilometers away from Silom – our 4 skiller cutters of sapphire cut diffusion sapphires from the smallest 4×3 upto 10×8’s in quantities of 100,200 and 500 carats at a point. It does happen that we take orders and cut on specific sizes, depending on the market condition. If you are looking for a one time $1,000 purchase, we are not the company for you. 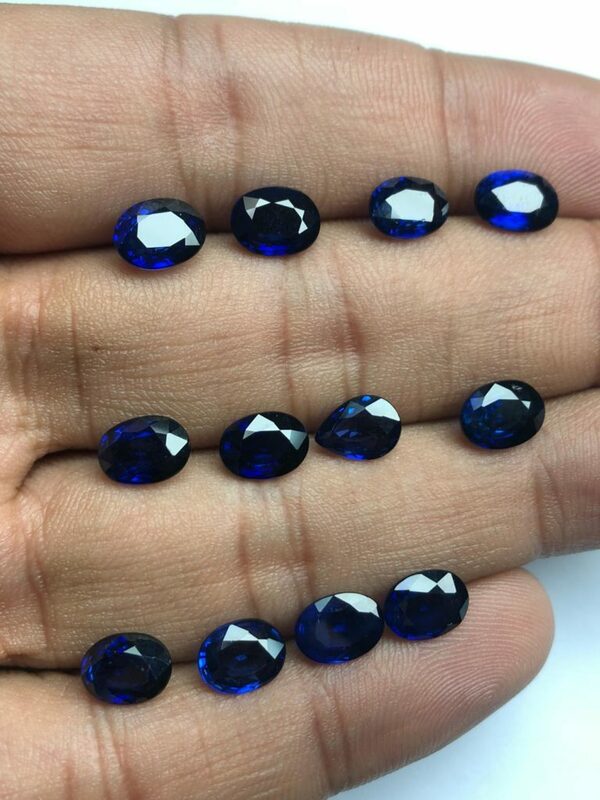 However, if you need quantities of diffusion treated sapphire every month, our company is the right source for it. We are direct source of rough from the mines in Madagascar and Ceylon and Kanchanaburi– with the help of our thai partners, we treat to perfection, our cutters leave no polishing marks, pits, holes in the finest of the quality. We produce however every quality from A grade (inclusion base) upto AAA, that’s how the rough comes out from the earth. This is the Diffusion sapphire process and the diffusion sapphire price can depend on its finishing of the polish and quality of diffusion treatment.